Brokers and Agents - Join Our Car Property Agent Network Today! Agents: Do You Believe in Niche Markets? Click here to get details on the type of real estate and businesses that the Car Property Niche includes. After you sign up, you'll be able to use our logo, website, national advertising and other marketing tools that we offer to you to help you find "Car Property" clients. Theses plans include 30 Exclusive Agent Network Zip Code Territories, plus you will be able to post an unlimited number of ADs in ANY category on CarProperty.com during the one year subscription the plan covers. These plans are by far the best value that we offer to real estate agents and they will save you quite a bit if you use all of the features that they offer, including either unlimited regular of featured ads in any category, plus 30 Exclusive Zip Code Territories in our network making you the expert in those areas (a free value of approx. $1,200). Our Agent Unlimited AD Plans that include 30 Exclusive Agent Territores for free (approx. $1,200 value) must be paid in advance. Sign up now by purchasing our Agent Unlimited Premium AD Plan that includes 30 exclusive territories. This requires that you post an AD first and then add your exclusive territories second. #2. Purchase Exclusive Agent Network Territories individually or in multiple territories. This method of joining our network, on an Exclusive basis, does not include any AD postings on CarProperty.com and any ADs that you would post in the future would require payment if the category you're posting in requires a payment. Click here for our AD price list. Please Note: Zip code territories can be priced higher than our base prices shown above, especially in popular territories where we have identified them as hot car property markets and where we have many agents requesting certain territories or where agents are on the waiting list for those territories. Each Car Property Zip Code Territory can be signed up for in these three real estate categories: Residential, Commercial, Business Opportunities. This means that if you want Exclusive Rights to one zip code territory in all 3 categories you would be charged $39.99 x 3 and the rights would be good for one year. Waiting Lists: Our system allows you to sign up on a waiting list for territories that currently have an Exclusive Rights holder in place. The way it works is that if you sign up under the waiting list, and if the current Exclusive Rights holder does not renew, then you will receive email alerts telling you that you can login and sign up. To sign up on our agent marketing network waiting list you must use our Map Search method for finding and signing up for territories, click here to use the Map Search method. When using the�Map Search Method to add Zip Code territories, you will know that you can be added to the waiting list for a territory if you don't see the available Exclusive sign up option for the zip code you are interested in for the category you are interested in (i.e. Residential, Commercial, Business Opportunities). Please note: If you've purchase our Agent Unlimited Premium AD Plan that includes 30 exclusive territories; every territory that you put on the waiting list counts as one of your 30 territories. How do I benefit and how do people find me after I sign up for Exclusive Territories? After you buy the Exclusive Territories, when people do a search looking for agents in those territories (whether they use the Map Search tool or the one territory at a time search tool) they will see you as the Exclusive and only Agent in those territories that you've signed up for. In the map search results that people will see when they do a search for agents in your area within a 100 mile radius or more, your name and link to your profile shows up in Bold font at the top of the search results pages. Also, you're name and a link to your profile will show up in the box in the left hand margin of almost every page on the site. You can see the box by going to the home page, look at the left hand column and you'll see New Exclusive Agents in our Network and the list of the most recent showing their name, city and state that they put in their profile. In future upgrades, we are working on making Exclusive Agent Territory holders also show up in the detail page view of ADs that have a zip code that matches or is in close proximity. We suggest you follow our�instructions provided below�and register or login and add the territories that you want to add from your Control Panel. Then decide if you want the Unlimited Ad Package or not that gives you 30 Exclusive Territories and unlimited ADs (either Premium or Featured depending on which package you want). If you want the Agent Unlimited AD Plan, please let us know and we can help process the payment for you; or you can, click on the�My Services Tab�in your control panel, and then select one of the Agent Unlimted Ad Plans to pay for it and we will make sure that your Exclusive Territories are Activated shortly thereafter. If you have any questions, please contact us via email or phone. 5. Whether you add one territory at a time or multiple, they will accumulate in the shopping cart. You can access your shopping cart anytime after you finish adding your Exclusive Territories, under the Tab titled: Agent Territories. 6. If you want to control the Car Property niche in your areas (through our website), then you must choose to add Exclusive Territories. 7. If you've purchased our Agent Unlimited Premium AD Plan, then please email us or call us when you've completed the steps described above. This means that after you've selected your 30 zip code territories, that's when you need to contact us ASAP so we can activate them for you. - You've paid for the Agent Unlimited AD Plan and then notified us that you want your Exclusive territories activated. In either case, your Exclusive territories are not guaranteed nor is there any indication that we have told you that your Exclusive territories are guaranteed until they are activated by one of the two payment methods described above and herein. - People will see you as the only qualified car property expert in your territories. You are the only agent who is connected with that territory on our site. - Top of List in Search Results! Your name and link to your profile will be at the top of both Standard Method Search and�Map Search �when people search to find agents in the CarProperty.com Agent Marketing Network who service their geographic areas of interest! - Yes, Recommended .... by CarProperty.com is what people see when they look at their search results and this is in addition to being at the top of the search list. See how you would be featured as an Exclusive Agent in our�Map Search for Agents�and you'll understand better the value in signing up to be Exclusive. 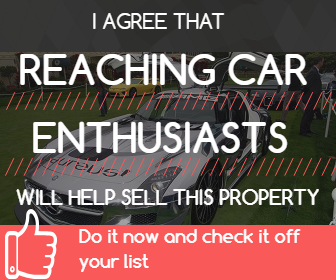 This recommendation is only for agents who have purchased Exclusive Territories in our network.- Rest Assured because you won't be wasting time and money marketing and promoting yourself to potential clients as the Car Property Agent in their geographic area who is affiliated with CarProperty.com, because you won't get bumped! You have No Reason Not to Join on an Exclusive Rights Basis: Our costs are low and Car Property clients are a very desirable demographic. There are hot car property markets and markets that are important to you and where you work. Why would you decide not to exclusively join our CarProperty.com Agent Marketing Network? You can only be signed up for one of these territories. These marketing territories are Free, but you will not hold these rights exclusively and will be automatically bumped when the Exclusive Rights are purchased. - These territories are not guaranteed and you can easily be bumped from them- When any of your territories are signed up for, by another agent, on an Exclusive Rights basis you get bumped from that territory without notice. - You could lose time and money spent on marketing yourself as an agent in our network if another agent purchases the Exclusive Rights and bumps you. - There's no limit to the number of agents that can sign up for each Car Property Zip Code Territory on a Non-Exclusive basis, in other words you and 10 or more agents could be signed up in each zip code territory, while getting the exact same interest from potential Car Property Buyers and Sellers. Please Note: If you sign up for more than one non-exclusive territory, we will delete all of them from your profile. On our site, an important thing for you is your profile and how visible your profile is to the members and visitors who use the site. After you join, you can make your profile as appealing as you want it to be, but more importantly is that you make it as visible as possible so other people surfing the site can find you. 2. Run ADs on the site in any of the the categories. 3. The more of both of these things (Marketing Territories and ADs) that you setup the more visible your profile will be (Your profile is linked to through ADs you place) . Don't miss out on this great opportunity to join the CarProperty.com Agent Marketing Network as an Exclusive Agent. This sign up method requires that you post an AD first and then add your exclusive territories second. Please remember that after you register on the site and whenever you login, you'll be in your control panel. You can add your Exclusive Zip Code Territories from your control panel only, so please login before adding your territories.�We look forward to working with you!